Collector’s Edition details also revealed. Piranha Bytes has been responsible for underrated RPGs like Gothic and Risen. With ELEX, published by THQ Nordic, it will look to combine magic and science fiction in one crazy universe. ELEX has a release date of October 17th and will head to Xbox One, PS4 and PC. THQ Nordic has also announced a Collector’s Edition that includes the game, a manual, artbook, a cloth map of the game’s world Magalan, a “combat drone” amulet, the original soundtrack and a 10 inch figure of an Alb Mage. As an open world sandbox RPG, ELEX has you playing as an Alb, stuck in a world without the precious resource to aid you. 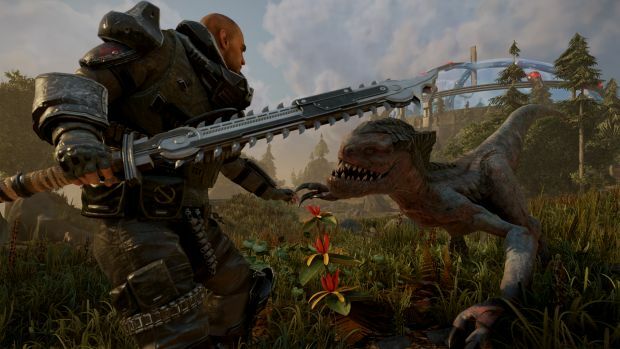 ELEX won’t restrict players from exploring any of its five regions from the start and will combine sci-fi tropes like mechs with medieval weaponry like swords and crossbows. Along with five regions, players can join four different factions and influence their path. What are your thoughts on ELEX and its Collector’s Edition? Let us know in the comments.